We invite you to explore India - the Land with infinite beauty ! Whether you soar high into Himalayas or peer under the ruins of the Ancient monuments dotting the landscape of India, you will cherish the experience long after your visit ! This India Travel Guide on Divine Motherhood Basilica Ranchi is free from any commercial interest! This site is dedicated to promote India - the vast subcontinent, its glorious past, magnificent landscape and its infinite variety. In the Roman Catholic Church, Blessed Virgin Mary is regarded not only as the Mother of God but also as the Mother of the Church. This veneration of the Divine Motherhood is based on Holy Scriptures. The Divine Mother Mary, as a mother of Jesus Christ, has a central role to play in the life of the Roman Catholic Church. Catholics venerate her as the Blessed Virgin Mary and they adore her manifestation in prayers, art, poetry and music. 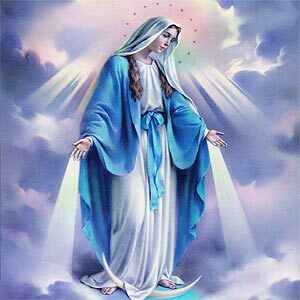 In the Roman Catholic tradition, unlike in other Christian groups, Mother Mary is revered significantly, with more titles, feasts and venerations. Marian writers over the years and saints and masses of believers have contributed to the growth of Divine Motherhood and Roman Catholic Mariology. One such Divine Motherhood of Our Lady Church is located at Ulhatu, Ranchi. This church particularly derives its importance from the fact that it is the first and only Marian Shrine in Chotanagpur. The origins of this church can be traced back to 1903, to a remote village called Kawali. It was here that a village primary school was opened and placed under the care of a catechist. A village chapel was built at Kawali in 1907 and later shifted to Bhuthataur in 1948. A primary school functioned from here also and a priest attended the mass in this church. This was a time when Ulhatu still formed a part of the Ranchi Cathedral parish. It was in 1952 when Fr Defrijn laid the foundation of the church and school building, living in a hut. The church was formally established in the year 1953. Soon pilgrims started flocking to Ulhatu to pay their homage to the Divine Mother of God. It is in this shrine that the miraculous statue of Our Lady of Halle feeding the Child Jesus is placed. There are several stories that are attached to the Divine Mother in this parish. Legend hails that when enemies attacked the city of Ranchi, the locals sought the help of the Divine Mother. The statue of Our Lady, received all the cannon balls of the enemies. She herself became black but the city was saved. This parish significantly happens to rest within the Horal Jungle Field Firing Range. There is another story which talks of a student Constant Lievens who went on a pilgrimage to Mary in Halle and got a confirmation of his vocation to the Ranchi Missionary. When Lievens visited Kawali village in the year 1989, he saved the lives of people there resulting in a movement towards the church. The story goes that Lievens was sick in Belgium and he yearned to return to the church in honor of Our Lady. Lievens passed away but his Mortal remains were sent to Ranchi in 1993 and his plan was implemented at Ulhatu where the Shrine was blessed in 1995. The Ulhatu church has village chapels attached to it in Banpur, Barhibera, Jaratoli, Kawali, Kudagarha, Plandu, Serengtoli, and Sogod. There are several convents that are run by this church including St Anne's Convent, Sisters of the Immaculate Heart of Mary, and educational institutions including St Joseph's High School, RC Middle School and Primary Schools, Convent School and St Anne's KG School and St Anne's Grihini School. There is also a St Anne's Dispensary that functions at Raja Ulhatu, Ranchi serving the less privileged members of the society.